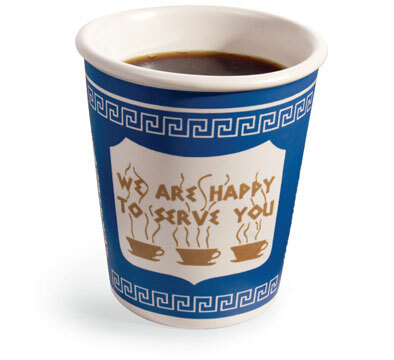 Tags: "Annie's Blue Ribbon General Store", "Greek Ceramic Coffee Cup", "Leslie Buck", "We are happy to serve you"
Sad news in the NY Times: Leslie Buck, Designer of the Iconic Coffee Cup (above), passed away on Monday at the age of 87. As anyone in NYC knows, this has been the Deli’s coffee cup of choice since the 60’s. Its image has been copied in several forms- many of which I love and sell at the shop (including the Lucky Beggar Coin Purse and the Coffee Cup Trash Can, complete with removable lid, Baby Tshirts in the paper cup version- and of course we carry the ceramic version of the original). Mr. Buck was head of Marketing for a Paper Cup company (the Sherri Cup Company) and ingeniously thought to tie the Blue and White Greek flag into the design of the coffee cup since so many Diners were owned by Greeks. The wording he added, “We are Happy to Serve You” just added to the brilliance of the imagery. Leave it to his passing for me to learn of this wonderful story. I tip my coffee cup to finally knowing the story and the man who that created this iconic piece of NY Imagery. 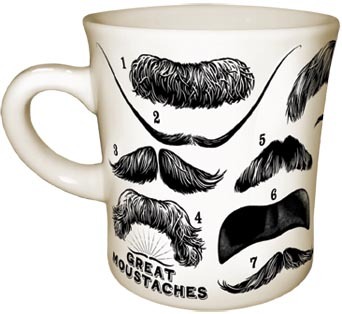 Tags: "Annie's Blue Ribbon General Store", "Great Drinkers Shot Glass collection", "Mustache Mug"
Toss back a few with some legendary literary greats. These writers are as famous for their drinking as they are for their work! 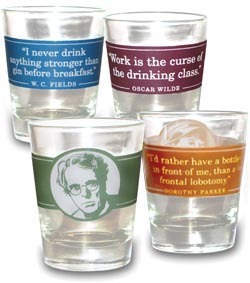 Have a drink in the company of Yeats, Oscar Wilde, Dorothy Parker and W.C. Fields. 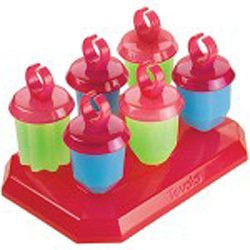 4 shot glasses in a gift box- $15.50. 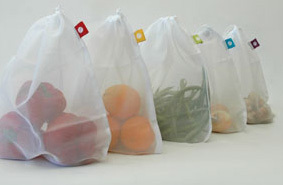 Re-usable Produce Bags- brilliant idea! Tags: "Annie's Blue Ribbon General Store", "Re-usable produce bags"
What a brilliant idea! 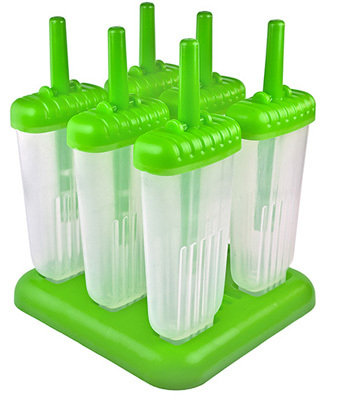 I got these in my Easter Basket and thought they were super clever and hunted them down for the shop. You can bring these re-usable produce bags to the grocery- weigh your fruits/veggies, then bring them home- clean them and then store them, all in the same bags (no more of those awful plastic bags at the supermarket). These 12″ x14″ are also good for travel toiletries, shoes, or toting around other little odds and ends. 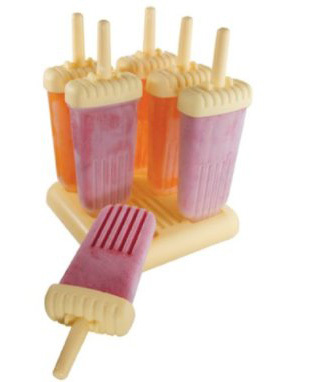 Set of 5 for $11.50. If you are a local shopper to Annie’s in our Brooklyn store, you might have seen the many signs we had out about Thompy the Dog, who had been missing (stolen from a local deli!!) for a week and a half. 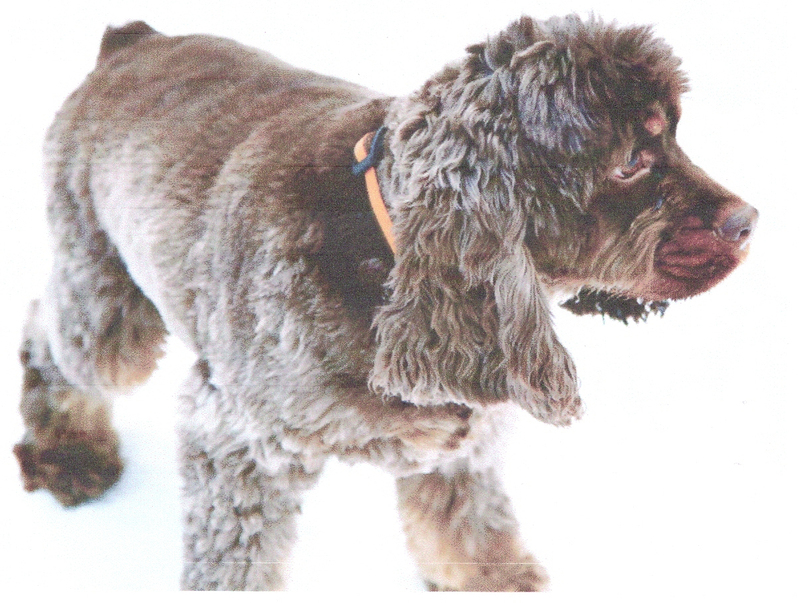 GREAT NEWS- he was returned to his owners (Rowena and Jon, great neighbors/friends/customers) yesterday! Yeah!!! We LOVE dogs at the store, so if you are shopping at Annie’s please bring in your pooch- instead of tying him up outside. A good rule to follow wherever you are (who knew dogs get stolen, but apparently its very common these days). Anyway– wanted everyone to know happy endings do happen these days! Our Wonderful Candles, now available online TOO!! Tags: "Annie's Blue Ribbon General Store", "Bon Chic Soy Candles", "Japanese Quince Toile Pagoda Candle", "Seda France candles", "Toile Pagoda Candles"
By popular request, all our yummy candles are now available online– from the delicious scents of our Best Selling Japanese Quince Pagoda Candles– to our favorites in the Bon Chic Soy Collection, they are now all available on our website for everyone to enjoy, no matter where you are! 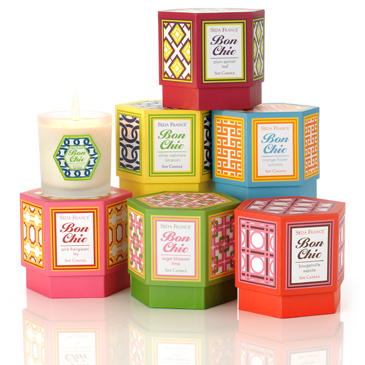 Toile Pagoda’s– $32, Bon Chic Soy Candles– $28.50. 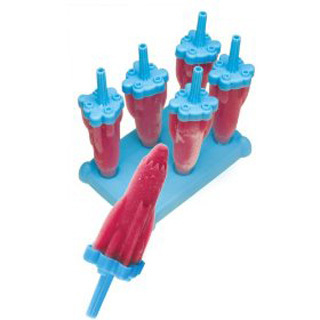 Tags: "Annie's Blue Ribbon General Store", "Groovy Ice Pop Molds", "Ice Pop Molds", "Jewel Ice Pop Molds", "Rocket Ice Pop Molds"
Rocket and Groovy Ice Pop Molds- $13.95. Tags: "Annie's Blue Ribbon General Store", "Bird Book Ends"
Tweet this people, these are the loveliest bookends to come around in a long time! 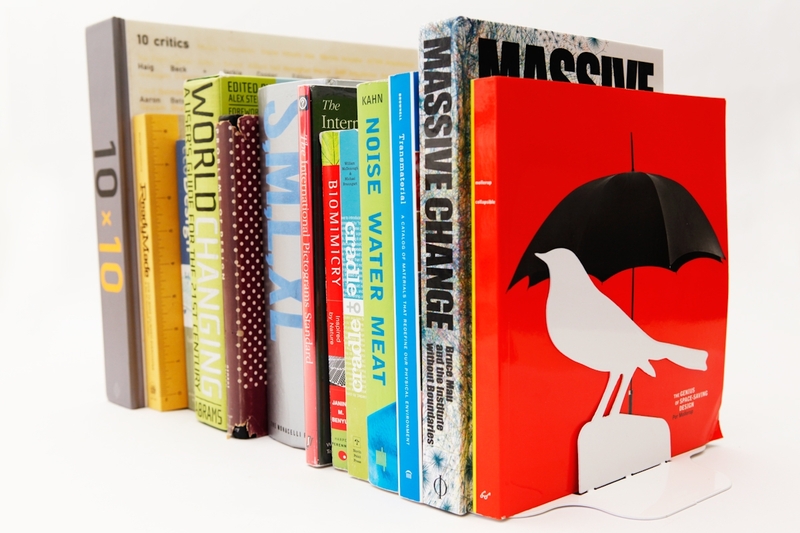 2 bendable metal (sturdy) Bird Bookends to make your bookshelf or desk more organized, and cool looking at the same time. 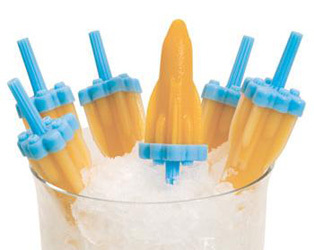 Available in Blue, Orange, and White. $35 for the set.